When you play roulette, the only way to always win is to cover every position. That gambit is apparently what Mercedes-Benz and parent company Daimler are doing,according to a release from Daimler. Daimler, like most automotive manufacturers, is pressing forward with vehicle electrification, but it’s not abandoning other engine technologies. At least not yet. “We will invest 14.5 billion euros in research and development in the next two years alone – more than half of it will again be spent on ‘green’ technologies. Just for our passenger cars, we are talking about 5.4 billion euros,” said Thomas Weber, member of the board of management of Daimler AG, who is responsible for Group Research and Mercedes-Benz Cars Development. At first blush, Weber’s statement appears to be consistent with an apparent automotive industry drive toward all-electric vehicles. That’s fortunate since the German government declared this week that all new cars sold and registered in Germany must be zero-emissions (meaning “electric”) by 2030. However, Weber then noted the company’s commitment to other motor technologies. He said Daimler is not committing to a single type of power train for all applications and is pursuing means by which the technologies can coexist. “Customers are not looking to sacrifice in the sense of ‘less car’ — in the contrary. That is why we emphasize enhanced efficiency through more intelligent technology – and we do it consistently in all model series. All the mentioned types of powertrains — internal-combustion engines that run on gasoline or diesel, plug-in-hybrids, batteries or hydrogen — have their justification and chances,” Weber continued. Mercedes is pushing forward on more-efficient, cleaner gasoline and diesel engines. Three additions will help the engines run cleaners: mild hybridization, more-efficient starter generators, and particulate filters. Starting in 2017, 48V mild hybrid motors will begin to appear on Mercedes sedans. By taking some of the power demand from the gas or diesel engine, the 48V system will cut fuel consumption. This additional smaller electric motor will bring hybrid-energy recovery, performance boost, and starting and maneuvering in electric-only mode to the full line of internal combustion engine-powered cars. Integrated and belt-driven starter generators will also improve efficiency, and particulate filters that are now standard with Mercedes diesel engines will be used for gas engines to reduce emissions. Starting in 2017, Mercedes will introduce hybrids with an all-electric range greater than 50 kilometers (about 31 miles). The added range will encourage drivers to view electric power as a standard power component, not just an around-town convenience. Longer trips on electric power only will also save fuel and lessen emissions. Next year will also bring the first wireless induction-charging system on an S-Class hybrid so drivers can just position their cars correctly to recharge the batteries without having to plug in (the plug-in port will still be standard for use when needed). Mercedes is developing the first combination plug-in fuel cell designs. By using a larger lithium battery than is used in other designs and adding plug-in capability, both range and refueling/recharging convenience improve. The plug-in fuel cell will be used first in the GLC F-Cell. When the fuel cell and plug-in are combined, the GLC will have a range of about 500km (310 miles). Further developments are intended to use stacked fuel cells in modular designs so the concept can be extended to applications from small cars to city buses. Mercedes-Benz fuel cell-powered Citaro buses have been in service since 2003, but the addition of plug-in battery power will further increase their range. Mercedes does not currently have any all-electric cars, but Daimler does. The diminutive Smart car now has all-electric versions of each model in the line and the Fuso Canter E-Cell light-duty truck has been in testing in Portugal and in Germany. The E-Cell has a 110kW, 150hp permanent-magnet motor that delivers a high level of torque to the rear axle from a standing start for performance that more closely resembles a powerful car than a 6-ton truck. As Mercedes-Benz moves forward on all powertrain technologies, the overall direction is clearly toward electric vehicles, whether powered by fuel cells, plug-ins, or a combination. 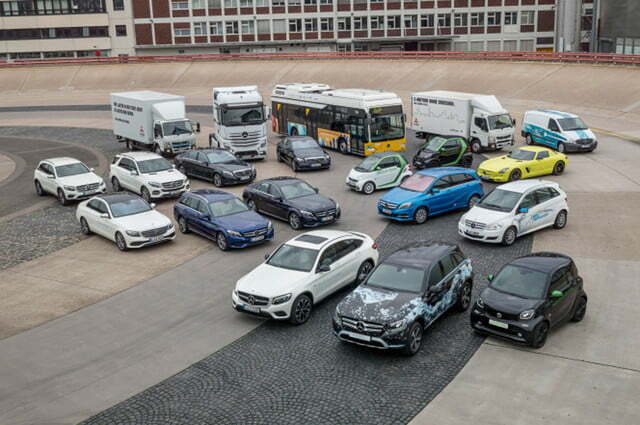 Daimler’s investment in battery factories and various home energy and charging systems will develop apace with its cars and trucks to facilitate what seems to be the inevitable shift from internal combustion engines to electric power.